As many of you all know I have been trying to sell some horses for some time now. It has not been really successful. The horse market is really a buyer's market. You can buy a really nice horse theses days for super cheap. So, for my yearlings, that are normal horses, it is kinda hard to compete with higher prices of the really nice bred yearlings. I have my two yearlings advertised on some horse selling web sites. I get questions about them every now and then. But just recently I received an email from a lady from Wyoming who was so very interested in buying Mac. 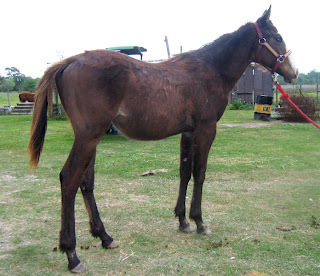 He is a registered breeding stock paint. That means he has no spots. He is really hairy from his winter coat. I have been shedding him but there always seems to be more hair. But, back to my story. This lady from Wyoming emailed me concerning my horse. 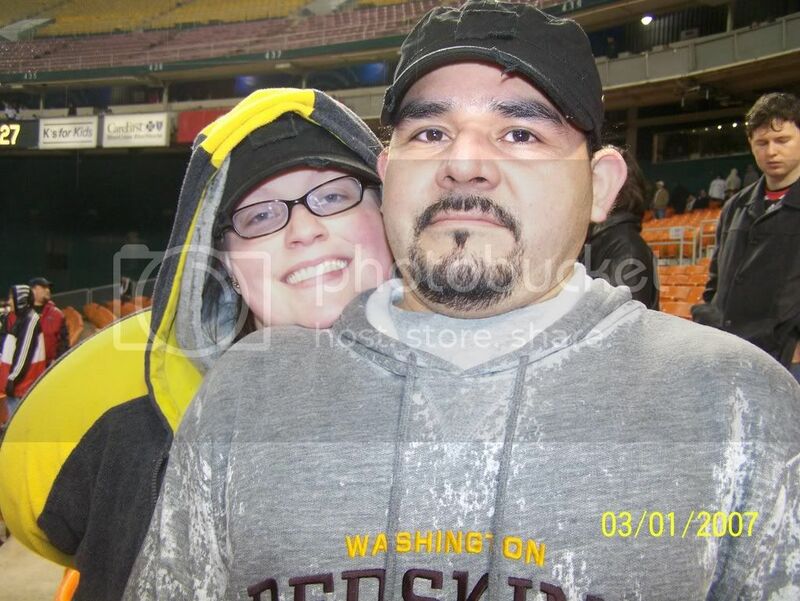 She wanted more pictures of him and then after she got those she wanted to buy him for her daughter's birthday. This made me curious. First thing that threw me off was that she is from Wyoming. That is where there are some really nice horses. Also, she would pass through Oklahoma, which too has some nice horses. So, why would she drive 27 hours to buy my breeding stock paint colt? Also, who buys a one year old horse for a little girl? Not any normal mother! That is dangerous. Yet the lady kept on emailing me and saying how her business partner was going to send me a check for the amount of $350. And then I was to contact her and she would send for a shipping service to pick up Mac. Strange, but if she really wanted it then fine. Now, I am blond but I am not stupid. My detective sister helped me Google the lady and the address that she gave me as her home. My sister did the satellite map thingy. It showed her living in an industrial area. Fishy, huh? Then my detective sister helped me come up with an email asking the buyer some questions and then suggesting she pay me using PayPal. The buyer never answered my email. So, I then sent her an email saying that if I didn't hear back from her then I would sell the horse to someone else. Then she replied. She told me how her business partner who was sending me the money had died in an auto accident. And the business partner sent a check but for the wrong amount of $3,000. The buyer then asked that when I received the check to cash it and make her change and send her the difference. This is where I laughed. Come on!! I might have been born at night, but not last night. Who falls for this stuff? I emailed her back telling her how sorry I was for her loss and how I was sure her business partner's lawyer could cancel the check and she could send the proper amount. I then never heard from her again. Until I received this in the mail a couple of days ago. 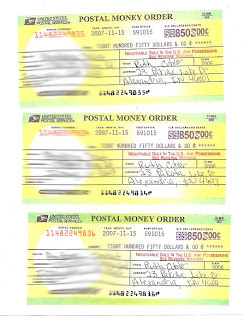 These are Postal Money Orders. Three of them in the amount of $850 each. The thing is, they were mailed from Fort Worth, Texas. Then the sender's name on the money order is from Indiana, and the buyer is from Wyoming! Come on!! I could not believe that the buyer still sent the money after I told her I was not selling my horse to her. So, I called my Dad, who is much wiser than I am in much of everything. (Okay he is wiser in everything, except maybe horses.) My Father advised me to take them to the post office and see if they were real. I then took them to the Post Office and the Postmaster said with out blinking, "These are fake. They are not even the right color. They do not have a water seal on them. They have the wrong check numbers....." He went on about how fake they were. I said that was great. He told me that he had never heard of someone trying this trick with buying a horse, but they try it all the time. He said the Frauds always send money in the amount of $850 and with either Money Orders or American Express Checks. He said they are very fake and most likely from overseas. It was a relief to have this whole thing over and done with. So, I advise you all to keep your eye out for fraud. Sneaky people are lurking everywhere. I warn all you fraud people to stay away from me and I will not be tricked. 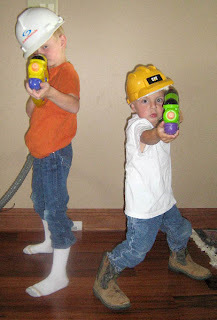 And if you try, I will send in my reinforcements. They are armed and dangerous. Well, if you don't mind being squirted with water. So, now Mac is back up for sale and if any of you would like to buy him, please feel free to do so!!! Until next time, y'all come back now ya hear. I hope you didnt trash them. You can call the local police, as well as the post master general and file a complaint (take copies of your emails too). The lady who wants to buy him can get in trouble - BIG TIME. 1) for fraud 2) for using the mail to commit fraud. Plus it may help someone else not get taken with fake money orders. I've heard of this scam before. I have read a bulletin about it somewhere so when Bubba had his old truck listed on Craigslist and someone from Germany wanted to buy it the same way, I knew it was fake. Who in their right mind would want a clunky old truck delivered to them in Germany??? Oh I'm glad you caught on so quick! It's sad to think that there are probably people that fall for this. About a year ago, I called on an add for a free puppy. I had to leave information like my email address then I got an email about how this person owns a freight company and the puppy, being free, I would have to send him a check for about $300 for it to be shipped to me, all in broken English. There are so many scammers out there ugh! I hope Mac finds a loving home! I knew I missed my calling in life. I should've been a secret agent/ Hunting down crazy, fraudulent thieves!! dadgum! Now that's a story!